May 2018. The chloroplasts of green plants convert light into chemical energy. The adenosine triphosphate (ATP) generated by photosynthesis is the prime source of biologically useful energy on our planet. Plants produce ATP by a large protein complex called the "chloroplast F1Fo ATP synthase", which is a macromolecular nanomachine par excellence. It consists of 26 protein subunits, 17 of them wholly or partly membrane-embedded. Scientists from the Max Planck Institute of Biophysics in Frankfurt now report a high-resolution structure of an intact chloroplast F1Fo ATP synthase, which enabled them to build atomic models of all subunits. Their study was published in the journal Science on 11 May 2018. 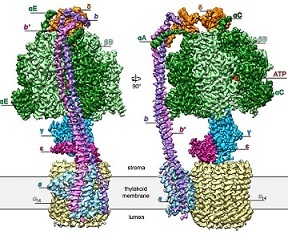 Rotary ATP synthases are cellular nanomachines that play key roles in energy conversion in every kingdom of life, including plants, humans, animals and bacteria. The new study represents significant progress towards fully elucidating this evolutionary conserved process, which is one of the most fundamental and ancient in biology. These nanomachines consist of many subunits and are membrane-bound. Capturing the complete structure of ATP synthases in detail has been hindered by their ability to adopt multiple conformations. Understanding the molecular mechanisms requires detailed structures of the whole complex, ideally at atomic resolution. Because of their dynamic nature, such a high-resolution structure of an entire, functional ATP synthase had not been available up to now. The team of scientists was led by Werner Kühlbrandt and Thomas Meier, who is now based at Imperial College in London. The scientists reconstituted the ATP synthase from spinach chloroplasts into lipid nanodiscs and determined its structure by cryo-electron microscopy. The resolution achieved ranged from 2.9 Å to 3.4 Å. The scientists were able to observe nucleotides with their coordinating magnesium ions and water molecules in the head of the ATPase, allowing assignment to the three well-characterized functional states involved in rotary ATP synthesis. The team could also show that the chloroplast F1Fo ATP synthase contains a built-in inhibitor triggered by oxidizing conditions in the dark chloroplast to prevent wasteful ATP hydrolysis. The features of the ATP synthases in chloroplasts and mitochondria were found to be remarkably similar, considering their evolutionary distance of a billion years or more.